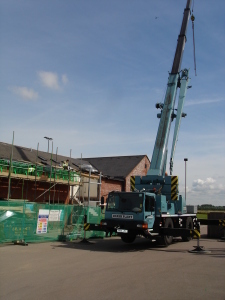 As the extension and improvement project at Chinnor Rugby Football Club that we designed and are managing reaches the half way point, we visited site to see the concrete stairs being installed with the assistance of a mobile crane. Part of the existing roof had to be removed to allow the stairs to be lifted in. This will be replaced shortly, and the extended areas will have aluminium roof sheeting fitted. Building works have also progressed well on the interior of the building, with both electricians and plumbers busy on the heating pipework, refurbished WCs and the new, larger kitchen. And whilst all the building work has been going on, the Club has still managed to operate as usual with adult pre-season team training sessions, touch rugby and even the hosting some functions for sponsors and members. The extension and improvements are due to be completed by September. This entry was posted in Chinnor Rugby Football Club, design, development, extension, Oxfordshire, pavilion, project management on July 11, 2016 by admin.